Where were you on June 15th 2005 ? Can’t you remember? Maybe Daniel Altman would know. 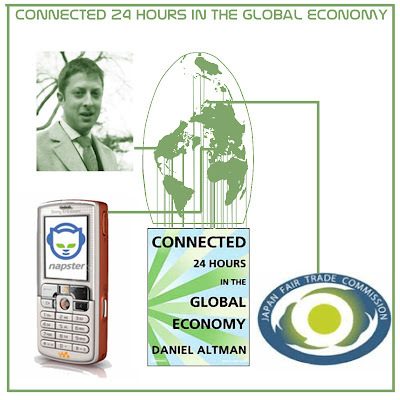 In his book Daniel Altman - Connected 24 Hours in the Global Economy (Publication Date: May 2007 - Publisher: Tantor Media Inc ) the Global Economics Correspondent of the International Herald Tribune, for which he moderates the blog Managing Globalization he also served as one of the youngest-ever members of the editorial board of The New York Times, Altman chooses a day, June 15 2005, and describes 14 circumstances from any place around the world. He uses the old cog-in-the-machine metaphor of the laborer with a new globally connected and empowered knowledge class. He begins each chapter with a news article or an email about a specific event somewhere in the world. We will then understand how this particular event relates to the global economy. This is the economist zooming in and out from the micro to the macro environment. His first chapter starts with two world clocks, the first in New York 12:03 am and the second in Stockholm 06:03 am of the day June 15th , 2005. In this day, precisely at this time Ericsson and Napster came up with a music service that would deliver songs to mobile phones and PCs interchangeably. This partnership took six months of negotiation. Ericsson, “a pillar of its nation’s corporate identity”, and Napster “is an upstart that began life as an illegal network of tech junkies and only recently became a respectable brand” showed that most successful linkups are usually built on a combination of comforting similarities and useful differences. Then Altman went to Tokyo to describe a cultural shift in the way Japanese people see competition and what happened at 04:02 p.m. at Fair Trade Commission’s office in Tokyo. Then Altman goes to Ho Chi Minh citiy, Hong Kong, Quingdao –China, etc. Connected is an important peace of work for those who want to understand the powers of globalization. Globalization was not a deliberated decision took by one person, group of people or institution, globalization runs by itself, every time you pay your bill or make a trip to some distant country, “The market is like the world’s oceans; add a drop to the Atlantic, and the water level everywhere else will rise” as Altman eloquently puts.